As the citizens of the Republic of South Korea protest for President Park Geun-hye to resign, the UW Korean Students Association joined in on the protest. Since her election in 2013, Park’s government has been involved in deceiving the public, such as having state-controlled history textbooks, and censoring those who spoke out against the government. After the Sewol Ferry tragedy April 16, in which a ferry capsized and over 300 people died due to inadequate boating standards set by the government, and an equally inadequate response from the national guard, families of the victims protested for compensation on their deaths. During Park’s visit to Ottawa, Koreans there protested for Park to pass a law concerning the incident. When it was discovered that Park gave Choi Soon-sil, a close friend of hers, the ability to influence government, citizens of the Republic of Korea began speaking up against Park’s government. Over 260,000 citizens have been protesting in the streets of Seoul, South Korea since Oct. 29 for Park to step down. 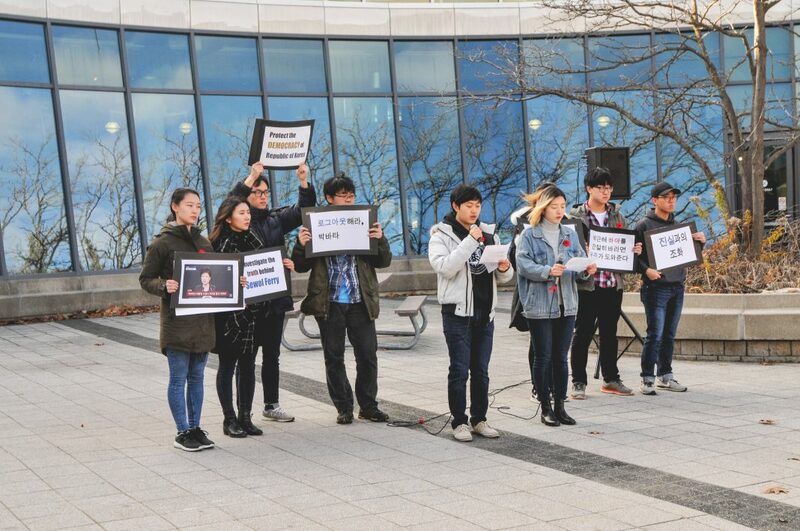 As the protests happened in South Korea, University of Waterloo Korean students Minyoung Yoo, JungIn Kim, YeounJun Park, Hyungwon Cha, Heeyeon Yoo, Alexandria Won, Jeyoung Oh, Jiwon Lee, Na Rae Kim, and others came together Nov. 11 to film their public denunciation of President Park and her government. They called out Park’s government for corruption and disgracing the democratic spirit. They called for an open investigation into the Park-Gate scandal and a proper investigation into the Sewol Ferry incident, as well as the resignation of Park. This article has been updated to include quotes from members of the UW Korean Students Association.